I lost the quote for the article I was writing, then I lost my patience and finally, I lost my cool. Why, oh why didn’t I use a post-it note to mark the quote in the book? Too busy? Too lazy? Too proud? All three? This frustrating moment conjured up for me the ending of an old story. Remember the glorious conclusion of Noah’s Ark? “Whenever the rainbow appears in the clouds, I will see it and remember the everlasting covenant between God and all living creatures of every kind on the earth.” (Gen 9:16) What a revelation! The first sticky-note reminder ever produced was the rainbow which God stuck in the sky as a prompt to himself that the earth would never again be destroyed by a flood. The rainbow, this gorgeous, vast, visual statement of count-to-ten restraint and love is not primarily a reminder directed toward us, it’s a reminder meant for God – imagine that! If God uses post-it notes to help his memory, then what’s my problem? “With humility comes wisdom,” says Proverbs. And it appears that a few post-it notes can’t hurt, either. A friend and I were talking about fishing, which I love, when he told me about a fishing festival that takes place in southern Minnesota in June. It is called “Bullhead Days”. 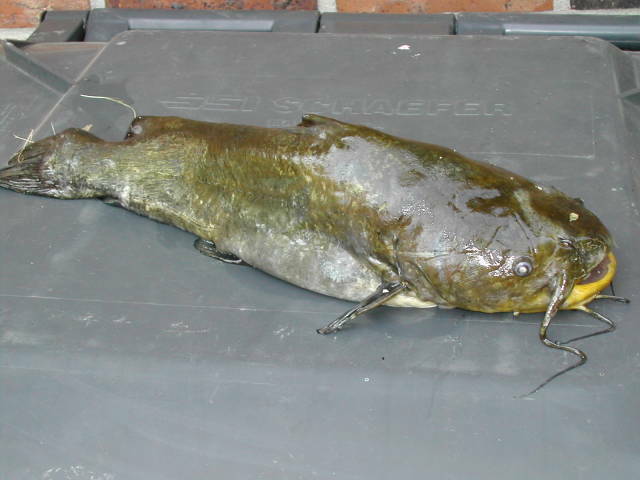 For those who may be unfamiliar, the bullhead is a species of catfish. The brown bullhead is also widely known as the “mud pout” or simply “mud cat.” It is not a thing of beauty, and although they are fun to catch, they are not generally a sought-after fish. In fact, bullheads are considered a nuisance by many anglers. I think it is a great idea to have a festival to celebrate the undervalued, under-appreciated and unlovely bullhead. Why not allow this fish to have a day in which to reap laurels? And I wish the many fisher-folk attending Bullhead Days in Watertown, MN all the best. Thinking of Bullhead Days brought back memories of fishing in my own hometown one warm June evening many years ago. It was a Saturday night and I was fishing alone on the shores of Lake Fremont. I was fishing solo because my husband, John, had decided to go fishing with his boss, Bill, instead of me. I was miffed at John because I was told that this was a ‘guys only’ fishing trip in a well-appointed fishing boat on a big lake, Lake Mille Lacs, some fifty miles north. I did a slow burn as John packed his things and drove away. “Fine!” I thought defiantly.”I will simply get my rod and tackle box and go fishing by myself!” And I did. I shook my head “no” as I carefully took the bullhead off my hook. “Sunnies,” was all I said. “Your hook is set too deep for sunnies – you are in the mud,” he offered, almost speaking to himself. I tried to make eye contact with him, but he was concentrating on throwing gear into the little green boat. “Thank you,” I said to the back of his head. He raised his hand absently, then got into his little boat, stretched out and pulled away. I didn’t see him again that night, or any other night that I went fishing on Lake Fremont. But he was right. I got my sinker and hook off the bottom, up out of the mud, and started pulling in lots of sunnies. I had a great time, bringing in several good-sized sunnies and releasing many others. I also enjoyed showing John my catch the next morning, and I tried not to gloat – much – when I learned that he and Bill had gotten skunked in their efforts to bring home trophy walleye from the large and beautiful Lake Mille Lacs. I never did fess up to the good advice I’d received from the Native American guy, the advice that turned a frustrating, miserable fishing outing into a fun and profitable evening. But in my happy fishing heart, I blessed that quiet, generous man, and asked God to give him many successful fishing trips in his little green boat. It wasn’t until much, much later that the broader application of the kind man’s words dawned on me. I wonder if you caught it? I believe that wise fisherman deserves to be called King Solomon, don’t you? A happy occurence! A friend and I managed to meet for coffee and conversation the other day even though Christmas is less than two weeks away! As we sipped our warm, fragrant beverages, we acknowledged this minor miracle, and admitted to the difficulty of making Plans for holiday company, meals, decorating,gift giving and church attendance, and then seeing Plan A morph into Plan B, or Plan C. We chatted about the challenge of staying in-tune with the heart of the season, the birth of Christ. As we talked, I expressed my longing for quiet times, and peaceful, un-rushed days. My friend expressed similar sentiments, but we both knew that those moments weren’t going to occur any time soon. I enjoyed the visit with my friend, and as I drove home I began to think about our conversation. Why, I wondered, did I think Christmas should be an un-hurried occasion? 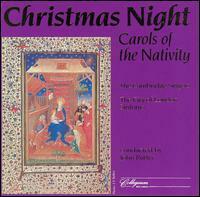 Have I been trying to make Franz Gruber’s song, Silent Night, the definition of the entire Christmas season? Joseph and Mary had a trip to Bethlehem forced on them for tax/political reasons, and they had to scramble to make the journey. Mary was almost 9 months pregnant when they left home; she had to be very uncomfortable on that donkey. The young couple didn’t make reservations for a room in Bethlehem, and you know what happened because of that. Apparently midwives in those days didn’t make ‘stable calls’, so Joseph and Mary had to handle things by themselves. The location for the delivery of Jesus didn’t meet any birthing center criteria that I have ever heard about – yikes – stressful! Mary was so rushed in her packing for the trip that she forgot to take clothes for the new baby. Angels made a considerable amount of noise not too far from the newborn baby, and Mary and Joseph had to deal with meeting strangers and entertaining company within hours of Jesus’s birth. Nothing relaxing, peaceful or quiet about that situation, was there? So why do I think I should have it any better? I love the Christmas carol Silent Night, but from now on I will be more realistic about trying to achieve the sublime state of peace represented in its lyrics. I will try to meet the expectations of the holiday season with more equanimity, and look forward to achieving the “all is calm, all is bright” mindset AFTER the excitement fades away on Christmas day. At least, that’s the Plan. Usually our Christmas family gatherings are a busy, noisy times, with the house full of people – adults,teens, small children and a dog. On Christmas Eve, we most often attend our own church, Bethel Christian Reformed Church, for Christmas observance. But every so often, when our daughter, her husband and family travel to North Dakota for the holiday, we have a quiet Christmas with only adults at the house, and we visit a different church to share in their Christmas celebration. 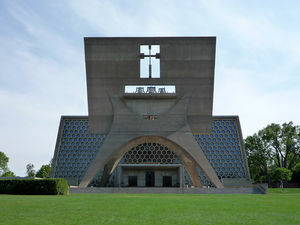 It was on one of these quiet Christmases that my husband, son and I decided to attend the Christmas Eve Service, often called “Midnight Mass” because of the late hour in which it is held, at St John’s Abbey in Collegeville, MN. St John’s Church and Abbey is a 60 mile drive from our home, so I checked on-line to make certain of the time of the service -we wanted to arrive in plenty of time to find a seat. Reading through the information I saw that there was to be a concert in the church prior to the celebration of the Eucharist. “Wow!”, I thought, “What a great a Christmas gift. We’ll get to hear the amazing church organ, the St John’s boys’ choir and the Abbey choir perform sacred music before mass, plus the music during the service.” Energized by this news, I packed up a little basket of Christmas cookies and a thermos of coffee, grabbed our travel mugs, and herded the guys out to the car for the trip Collegeville. It was a beautiful, clear,cold night. The moon was round and bright, and cast enough light on the snow-covered ground that we could easily see across miles of rolling farm fields as we travelled. When we got to the church, the parking lot was close to full even with an hour to go before the service started. It was wonderful to walk up the steps, open the huge doors of the church and see and smell the lovely pine boughs throughout the worship space.We were fortunate to find a place to sit close to the back of the church. I was a little disappointed that we were so far away from the front, but grateful that we arrived in time to find a seat and hear the pre-service concert. I noticed that a young couple with little kids was seated behind us in the very last pew. I groaned inwardly, wondering why parents would bring such young children to church so late at night, and hoped that the kids wouldn’t get tired, cranky and loud during the service. As I looked toward the front of the church, toward the altar, I was struck again by the simple, profound beauty of St John’s church with its Marcel Breuer design, http://en.wikipedia.org/wiki/Marcel_Breuer, and pondered the contrast between the modern architecture and the ancient celebration of Christmas. There was certainly an undercurrent of happiness filling the gracious space. The entire setting, the musicians and the people attending all seemed to be filled with excitement. When the concert ended, all the electrical lights were put out and only candles lit the perimeter of the huge sanctuary.Then a choir of monks began singing the Introit, or introduction, to the mass, which was a Gregorian chant. At the end of this chant, the lights came up in the church and the congregation sang “Oh Come All Ye Faithful.” The celebration of the mass included readings from the familiar Bible story of Christ’s humble birth. It was after one of the scripture readings that I heard the cry of the baby from the family behind us; it was definitely a newborn cry, piercing and demanding, but instead of reacting negatively to the plaintive tone, which I was fully prepared to do earlier in the evening, a small miracle occurred: I realized what a meaningful experience it was to hear the same sounds at church on Christmas Eve in the 21st century that Mary and Joseph, the shepherds and the angels heard on that first Christmas night; not the sounds of a full-throated organ,or Gregorian chant, but the cry of a healthy newborn baby. The remainder of the service was truly moving. I was so very glad that we decided to drive the two hours to participate in Christmas Eve at St John’s. Yet as beautiful as it was, the moment I remember most tenderly is the cry of the newborn whose young family was seated behind us. No other part of the service touched my heart more, or brought the Christmas story more clearly into focus than the sound of that baby’s tiny wail. The very noise that I had dreaded to hear during the service had become the source of my deepest happiness that night, and I remember it as a lovely Christmas Eve gift.